Butter Pretz: I absolutely loved this flavor. I'm a fan of 'buttered' flavor snacks and this one pulled through with rich butter flavor with a slight sweetness of the biscuit. The biscuit is a thinner and crisp. Olive Pretz: This brought the Pretz game up to another level! This thicker breadstick like biscuit has an air of gourmet-ness to it. The biscuit was great with a nice crisp crunch and full of flavor. I didn't get much of an olive flavor but I felt like I was eating garlic bread. I can see this paired up with a tomato soup or in salads! Olive and Cheese Pretz: The last of the flavors I tried was in another Olive Pretz form with a cheese flavor. The cheese flavor in very strong and I can see people either liking or disliking it because it can be a bit much. I however love cheesy snacks and this one was right up my ally without being to fake tasting. I can see this one paired with soups and salads as well. Strawberry Pocky: They finally brought back the strawberry Pocky with the actual strawberry bits! I love the summer packaging with a meadow/picnic like background. Still tasty and still a favorite. 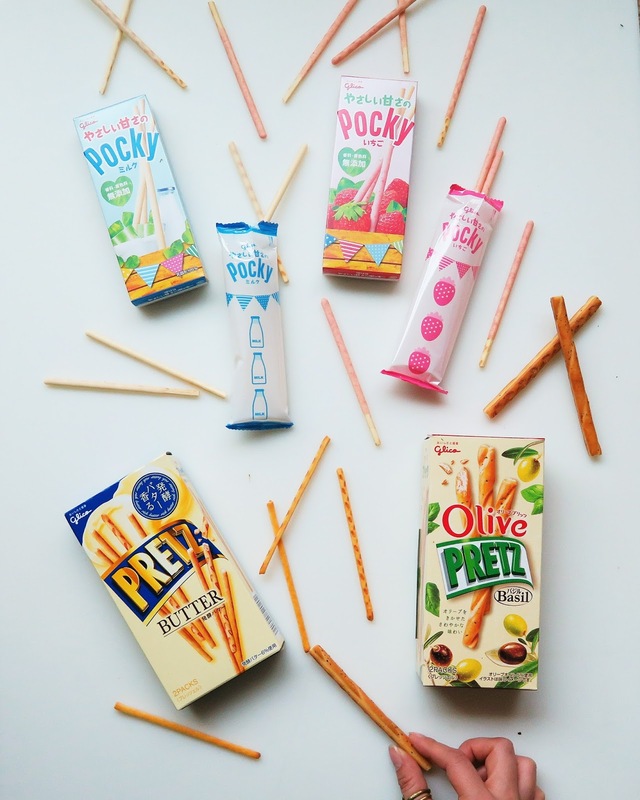 Milk Pocky: I'm so glad they brought back the milk flavor for summer! This packaging mimics the strawberry one. The milk flavor is so underrated with a subtle sweet cream flavor. I haven't had this one in what felt like years and I'm so glad they brought it back, especially to the U.S. market! That's it for my Glico Pocky and Pretz review. Have you tried them before? What are your favorite flavors?